Anyone who sees Hailey carpenter Nate Scales getting on the morning bus heading north carrying a backpack the size of a hay bale can bet that he will be flying over Ketchum on his paraglider that afternoon. What is uncertain is where he will land. It could be Stanley, Challis or even farther afield. Scales travels at speeds of 25 to 45 miles per hour, whisking over several mountain ranges in a single afternoon. Over the years, Scales has hitchhiked many miles, slept in ditches and made many friends while finding his way home from flights. These trips have changed his perspective on the world below. "You get a sense of respect for how amazing this world is, and how fragile we are, and how lucky we are," Scales said. Last August, Scales made an eight-hour, record-setting flight from Bald Mountain to Spencer, near the Idaho-Montana border. He flew 148.5 miles that day, reading the winds for thermals, or updrafts, navigating with a GPS and just being generally overwhelmed by the experience. "It is amazing at this point in our evolution as human beings that we can jump off the side of a mountain, for fun!" he said. "We are not designed to fly, but here you have it." Scales was working at Ski Tek in Ketchum in 1992 when Dave McCormick gave him basic paragliding instructions at Atkinson Park before launching him off of a 400-foot hill in Timber Gulch near East Fork. "He didn't know what he was doing and neither did I," said Scales, who later yelled to a friend at work, "I flew, I flew, I actually flew!" He soon moved to Salt Lake City and took a job as a paragliding instructor. The sport was young and had few rules. Today, there are professional associations that provide guidelines for pilots and students. "Gravity is a pretty good rule," Scales said, "one that you can't really do away with." Scales said the prohibition against landing and taking off within national parks and wilderness areas is senseless, leading to a "cat and mouse" game between park rangers and paragliders. "It's pretty ironic," he said. "Especially because the Jackson Hole airport is in Teton National Park. There is almost no impact from paragliders, a dozen or so footprints at most. If someone were to crash into a tree, the tree would win." On a flight three weeks ago, Scales had a moment to consider that possibility in stark detail. At an altitude of 10,000 feet, but only a few thousand feet above the White Cloud Mountains foothills, he got into trouble. Thousands of acres near Fourth of July Creek burned in a forest fire in 2005. The charred landscape still produces large updrafts of hot air from the treeless hillsides. This hot air is what paragliders seek to make long-distance flights. Scales intentionally caught a fierce updraft to gain altitude, but kept getting "bucked out" of the thermal column. On the third try, his paraglider wing collapsed in on itself. The control ropes were ripped from his hands and he began to plummet. "I pulled my backup parachute for the first time in 19 years," he said. "The two seconds it took to deploy were the longest two seconds of my life." Scales landed in a half-acre clearing at 8,400 feet, the only clearing for miles around. "I wasn't frightened. I was mostly disappointed that I had to land on such a great day. If you take the time to learn, there's no reason to be scared." Scales has taken his 5-year-old daughter, Ripley, flying. "She loves it," he said. "Because we're together and because she knows how much it means to me." 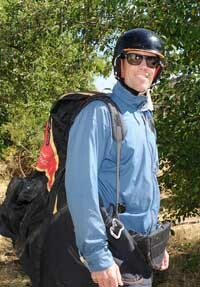 Scales has traveled to eight countries to compete in paragliding races, crossing the length of the Alps from Salzburg, Austria, to Monaco in 2007 for the Red Bull X-Alps race. His wife, Lisa, and Ripley followed in a motor home as Scales flew and hiked for 14 days to the Mediterranean Sea. On a boulder-strewn ridge in Switzerland, Scales found help from an elderly couple who held out his paraglider long enough for him to get speed enough to leap into the air. "I bounced like a mountain goat until I took off," he said. This summer, Scales will team up with Nick Greece, the No. 1 ranked paraglider in the U.S. for an eight-day trip from Richfield, Utah, to Jackson, Wyo. As much as possible, the men will land atop mountains and take off from these heights again the next day. "No one has done this yet in this country, so I guess we better get on it," Scales said.